Vero Beach Boys Ranch is located in Florida and offers teenage boys solutions to today's serious problems. – boarding schools and schools for troubled teens. Treasure Coast Boys Academy is a nonprofit year-round residential program designed for boys who are at risk or otherwise struggling. Treasure Coast Boys Academy provides a safe haven for boy’s ages 12-17 years of age with out-of-control behaviors. The 15-month program includes on-site schooling in a classroom setting, daily discipleship, chapel and worship. The young men are presented with opportunities for group and individual counseling, family counseling, organized sports and recreation. Leadership skills, developing integrity and the importance of work are learned through indoor and outdoor chores and responsibilities. Our residents enjoy a well-equipped campus, including gym, professional weight room, soccer, baseball, basketball, lacrosse, swimming, fishing, hiking, camping, rafting, horseback riding and more. 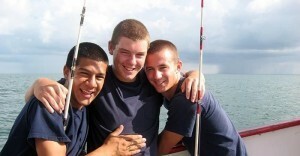 We go on mission trips and the boys go on frequent fishing trips in the area waterways and Atlantic ocean. We use adventure as an opportunity to form strong relationships with each boy with a goal to bring about life-change. The property features a well-equipped gym and weight machines, soccer field, baseball diamond, basketball court, pool, game room, fishing ponds, and professional sport fishing boats to take frequent fishing trips. They have horses on the property that are often ridden, and at times taken on camping trips. They form strong relationships with each boy and much of the life changing experiences take place while involved in these outdoor activities. They believe that the first change is a heart change. Hiking, canoeing, camping, and outdoor activities are usually not a part of the lives of most young people today, but they are with the boys here. God’s great outdoors is a great place for each of us to connect with each other and with God. It is through these fun outings that we so often are able to get the root of the issues in a boy’s life. It’s an easy place to talk and share hurts and pains; then the campfire that evening gives opportunity to further talk and pray for one another. These trips are memory makers that last a lifetime! Treasure Coast Boys Academy provides focused and individualized academic attention for the students in its care. Education goes on and credits are earned, but education is not our program’s primary focus. Character, integrity, hard work, and respect for others are what we concern ourselves most with. If those attributes are in place, education is more easily accomplished on campus and when the boy returns home. Therapy is ongoing at Treasure Coast Boys Academy – all day, every day. Individual counseling sessions are not as frequent as the many 10-15 minute life coaching that takes place during school, work, or a sporting event. As was once said, the outside of a horse is good for the inside of a man. A simple horse ride can provide a life changing conversation in a young man’s life. The same can be said for a day on the lake fishing with a good mentor. A safe haven is provided for boys ages 13-18 years of age with out-of-control or at-risk behaviors. The program includes on-site schooling in a classroom setting, daily discipleship, chapel and worship. The young men are presented with opportunities for group and individual counseling, family counseling, organized sports and recreation. Leadership skills, developing integrity and the importance of work are learned through indoor and outdoor chores and responsibilities. Vero Beach Boys Ranch is located in Florida and offers teenage boys solutions to today's serious problems.